Huawei’s Mate 20 Pro offers a massive OLED screen, a fingerprint scanner embedded inside the display, three cameras on the back, an ultra-fast Kirin 980 chipset, a huge 4,200mAh battery, and 3D face unlock. Launched in London last week, Huawei is finally bringing the Mate 20 Pro to India next month as an Amazon exclusive at a “premium price point”. This is the first time Huawei, the world’s second-largest smartphone maker, plans to launch its flagship Mate series in India. Earlier this year, the Shenzhen-based company had also introduced the P-series in India for the first time. The Mate 20 Pro tries to be an all-rounder good at everything from performance to battery life. But is that enough to challenge the incumbents, especially when the iPhone XS Max (including the iPhone XS) and Galaxy Note 9 have been praised for their top-notch performance? I got to try the Huawei Mate 20 Pro ahead of the India launch in New Delhi. This is what I think about the Mate 20 Pro based on my initial impressions. surprised to see how the Mate 20 Pro and Mate 10 Pro look apart from each other in terms of the design language. The curved edges on the sides and the square-shape module that houses the three Leica rear cameras lenses and flash makes the Mate 20 Pro stand out from the rest of flagship devices launched this year. But I must say the Mate 20 Pro is a huge phone. It doesn’t feel heavy though, surprisingly. The Mate 20 Pro has a glass back with an aluminium frame (like all other flagships of 2018). The phone comes in five colour options: pink gold, midnight blue, emerald green, twilight, and black. In India, however, the company might only bring the phone in either twilight or emerald green. Huawei is also introducing a new texture to the Mate 20 Pro. It’s called a “hyper-optical display pattern”, and it’s only found on the emerald green and midnight blue models. The handset is also IP68 water and dust resistant. On the front, though the Mate 20 Pro feels a lot like the Samsung Galaxy Note 9, thanks to a 6.39-inch curved OLED screen. The bezels are smaller and the phone features an “octa-curve” design where the front and back glass is curved on all four edges. 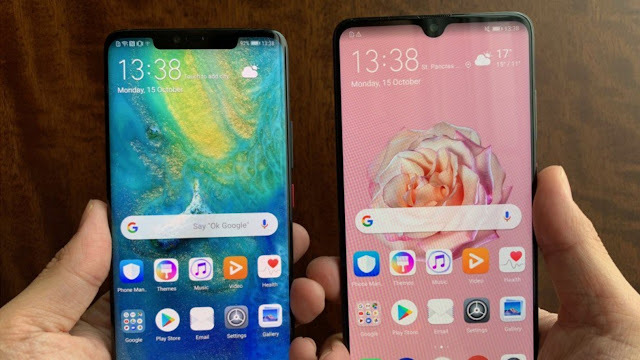 But unlike the Note 9, Huawei Mate 20 Pro has a notch that’s actually bigger than the one on the Mate 20. That is because this notch features a 3D depth-sensing camera, similar to Apple’s Face ID found on the iPhone XS and iPhone XS Max. The volume controls are next to the power button on the right-hand side of the screen. The SIM tray is on the bottom, just next to the USB Type-C port and the “invisible” speakers. And yes, there’s no 3.5-mm headphone jack on the Mate 20 Pro. New to the Mate 20 Pro is a smaller Nano SD card, which is Huawei’s own proprietary format. Simply put, the phone does not offer the standard microSD card, which is really frustrating. We have no clue when the new Nano SD will be available for purchase and how much it costs. l now Samsung’s Note series has been the gold standard for the best screen technology. For instance, Samsung Note 9 comes to the top on the display front. With the Mate 20 Pro’s 6.39-inch display, Huawei is giving a tough challenge to Samsung. The OLED display (3,120 x 1,440 pixels, 19.5:9 aspect ratio), which by the way is made by China’s BOE technology group, is sharp and bright with inky black, bold colours and great viewing angles. I can’t wait to put the Mate 20 Pro and Galaxy Note 9 side by side and compare them on the basis of the display’s brightness level and colour accuracy. Just above the phone’s massive 6.39-inch screen is a notch which houses a 3D depth-sensing camera for facial recognition, along with a 24MP front-facing camera. The set-up consists of a 24-megapixel RGB camera with a dot projector, proximity sensor, floor illuminator, and an IR camera. I am yet to test the feature myself, so it would be difficult to pass on the final verdict so early. Hopefully, we will be in a position to offer a detailed write up on how the unlocking method works in our testing. Alternatively, there’s a fingerprint sensor that is embedded inside the screen. Put your finger on the fingerprint icon visible on the screen, and unlock the device. I briefly tested it during a quick hands-on, it worked as advertised. Vivo already offers the same feature on some of its phones, and the upcoming OnePlus 6T will also come with an in-display fingerprint sensor. After the iPhone XS series, the Mate 20 Pro to offers a 7-nanometer processor in a phone. Both the A12 Bionic and Kirin 980 processors are proprietary chipsets. In case of the Mate 20 Pro, Huawei says its custom-made Kirin 980 chipset offers a 20 per cent speed improvement over the Kirin 970 which powers the Honor 10 and P20 Pro, along with 40 per cent better power efficiency. A total of eight cores are there: two running at 2.6 GHz for peak performance, while at the other four 1.8 GHz cores take care of low-power tasks and two 1.92 GHz cores. Most importantly, the Kirin 980 chipset has dual neural processing units (NPUs) (last year’s Kirin 970 had a single neural core), the first to handle tasks like recognising objects and render video in real life that is needed to take advantage of artificial intelligence (AI) and machine learning. The company claims the Mate 20 Pro is one the fastest smartphones in the market today. Based on my limited testing, I can say that the Mate 20 Pro feels fast and slick. Again, I have not yet been able to run the Huawei Mate 20 Pro through its full paces, but early impressions are encouraging. While the Mate 20 Pro is a superior device from the hardware point of view, I must say a lot has to be done to perfect the software experience. For starters, the Mate 20 Pro runs Android 9.0 Pie, with Huawei’s EMUI 9.0 skin on top. Yes, the user interface has been improved a lot, but the problem is that it is fairly cluttered, and the icons are just terrible. For a flagship phone of the caliber of the Mate 20 Pro, Huawei needs to put special emphasis on the user experience in order to make the device as good as the iPhone XS and OnePlus. Let me remind you that the unit provided to me during the hands-on was the test device and one should expect the UI on the retail unit to be better and more localised. awei Mate 20 Pro comes with a 4,200mAh battery, the first flagship smartphone to have one. For comparison sake, the Galaxy Note 9 has a 4,000 mAh battery. So we are expecting the battery life on the Mate 20 Pro to exceed that of Note 9’s impressive battery life. Also, remember that the Mate 20 Pro comes with a 40-watt Super Charger that promises to get the handset to 70 per cent charge in just 30 minutes. Most flagship smartphones launched this year — be it the iPhone XS, Note 9 or Pixel 3 XL supports wireless charging. The surprising part of the Mate 20 Pro is that it also acts as an external Qi wireless charger. To test it out, I dropped my Pixel 3 onto the Mate 20 Pro and it automatically started charging. It’s a very handy feature that could get you to charge the other phone in times of emergency. Huawei Mate 20 Pro gets the 40MP wide-angle camera and 8MP telephoto lens as seen on the P20 Pro that also offers a 3x optical zoom. The P20 Pro was the first commercially available smartphone to feature a triple camera setup on the back. With the Mate 20 Pro, Huawei has retained Leica-branded triple camera lenses but made a few changes here and there to enhance the experience by adding smarter AI features. So the Mate 20 Pro gets the 40MP wide-angle camera and 8MP telephoto lens as seen on the P20 Pro that also offers a 3x optical zoom. Now, the difference between the two is that the 20MP monochrome sensor which featured on the P20 Pro has been replaced with a 20.2MP ultra-wide angle lens. The implementation is similar to that of LG’s V40 triple camera setup. Based on the limited time spent with the phone, I found that switching between three lenses was fast. You have to slide out a zoom slider down on the screen to able to access ultra-wide-angle lens. Like the P20 Pro, Huawei has added AI features (it can now recognise 1,500 scenes) into the Mate 20 Pro’s camera. It can recognise various scenes and adjust camera settings to get the best shot. Then there is the AI Cinema Mode and AI 4D Predictive focus, which unfortunately I couldn’t test due to the scarcity of time. On the front, a 24MP camera has been given, but I haven’t had a chance to test it. Expect a detailed camera review and comparisons with the iPhone XS and Note 9. We are also excited to pit the Mate 20 Pro with the Pixel 3, which has been well praised for its camera especially in low light. The Mate 20 Pro represents Huawei’s growing ambitions to compete with Apple and Samsung in the high-end segment. While the company is not chasing volumes with the Mate 20 Pro in India, it says the idea is to offer consumers an alternative to the iPhone XS Max and Galaxy Note 9. At the moment, we can’t confirm pricing and availability of the Mate 20 Pro in India. All we know is that the launch is set for next month and the phone will be exclusive to Amazon India. The Mate 20 Pro is already available in the UK and in various European markets where it is priced at €1049 (or approx Rs 88,871).